Is this to be the last Guildford Pancake Races held in Europe? Where will our batter come from next year? NEVER MIND - Put all that behind you and come and have some fun in the High Street on 5th March 2019. This year both Eagle Radio and the Charlotteville Jubilee Trust will be sponsoring a new local charity set up by the Mayor of Guildford Cllr Mike Parsons. Mike’s primary charitable aim – “Guildford Young Carers” – is new, innovative and addresses an area of society that is very much overlooked by us all. Estimates suggest that as many as 8% of children aged 5 to 18 in many areas of Guildford act as carers – unrecognised and hidden to society. The effect on these children is huge. Some fail to realise their academic potential, and they often suffer mental health issues, bullying and social media abuse. These are young people who find their normal young lives being replaced by caring for a relative within the family unit. These responsibilities often cause negative outcomes, such as falling behind at school, or simply a loss of precious childhood time. These children and young people are often unable to access help and many do not even realise that they are acting as carers – it’s just what you do. It’ll be a strange one this year! Firstly it will be held at the same time as the farmers market which often upsets the farmers as we take up some prime pitch space for our 50 metre course. 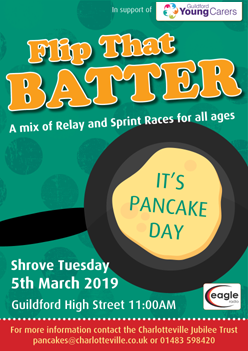 If you can please make sure you buy something from the many stalls that will be there and mention that you are only there for the Pancake Races and what a lovely market you have here etc ………. Secondly we have local elections on 5th May this year and that can often bring out all sorts, it may be the only time you will get to actually see your borough councillor in action - don’t miss out. Please support these races which are entirely self funded. We rely on the generosity of our many sponsors and the keenness of the local town community to keep the races as a fun event so many can take part in. What will I be letting myself in for? If you haven’t taken part before, why not take a look at a few past events: 2016, 2017, 2018?